According to Hopi oral tradition, as it is recounted in Tony Hillerman's work, the settlement was abandoned after conflict with the neighboring village of Walpi, which is still inhabited today. While historians are uncertain as to why Sikyatki was abandoned, there is some consensus that the people left the village as such conflicts escalated. It is estimated that the village was first settled in the 1400s and abandoned between 1500 and 1600, before the arrival of the Spanish colonizers. In his novel 1980 Navajo detective novel THE DARK WIND, Hillerman portrays the village as still being a settled community, while in actuality Sikyatki has not been occupied for centuries, although it remains a significant, sacred site to the Hopi. "Decorated bowl from the ruins of the former Hopi village of Sikyátki, circa 1400-1625 AD" by Millicent Rogers Museum is licensed under CC BY. 2000 A Nampeyo Showcase. 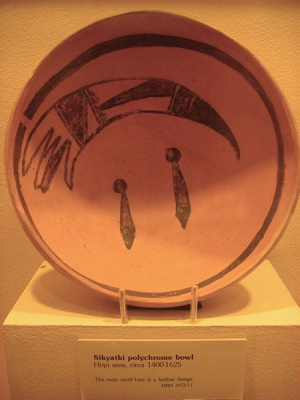 Ancestral Hopi Pottery. University of Arizona. http://www.statemuseum.arizona.edu/exhibits/nampeyo/sikyatki.shtml, accessed February 20, 2015. Lomatuway'ma, Michael, Lorena Lomatuway'ma, and Sidney Namingha, Jr.
1993 Hopi Ruin Legends: Kiqotutuwutsi. Trans. Ekkehart Malotki. Lincoln: University of Nebraska. 2007 New Perspectives on Pottery Mound Pueblo. Albuquerque: University of New Mexico Press.